AC power plugs and sockets are devices that allow electrically operated equipment to be connected to the primary alternating current (AC) power supply in a building. Electrical plugs and sockets differ in voltage and current rating, shape, size and type of connectors. The types used in each country are set by national standards, some of which are listed in the IEC technical report TR 60083, Plugs and socket-outlets for domestic and similar general use standardized in member countries of IEC. The scope of IEC TR 60083 states: The report only contains systems for which standard sheets have been published in a National Standard, which may be a National Standard of the country itself or any other IEC member country. Plugs and sockets for portable appliances started becoming available in the 1880s, to replace connections to light sockets with easier to use wall-mounted outlets. A proliferation of types developed to address the issues of convenience and protection from electric shock. Today there are approximately 20 types in common use around the world, and many obsolete socket types are still found in older buildings. 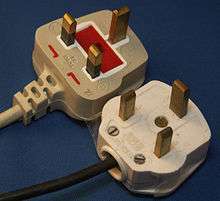 Co-ordination of technical standards has allowed some types of plugs to be used over wide regions to facilitate trade in electrical appliances, and for the convenience of travellers and consumers of imported electrical goods. Some multi-standard sockets allow use of several different types of plugs; improvised or unapproved adapters between incompatible sockets and plugs may not provide the full safety and performance of an approved socket and plug combination. Generally the plug is the movable connector attached to an electrically operated device's mains cable, and the socket is fixed on equipment or a building structure and connected to an energised electrical circuit. The plug has protruding pins or, in US terminology, blades (referred to as male) that fit into matching slots or holes (called female) in the sockets. A plug is defined in IEC 60050 as an accessory having pins designed to engage with the contacts of a socket-outlet, also incorporating means for the electrical connection and mechanical retention of flexible cables or cords, a plug does not contain components which modify the electrical output from the electrical input (except where a switch and/or fuse is provided as a means of disconnecting the output from input). 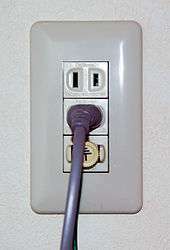 There is an erroneous tendency to refer to power conversion devices with incorporated plug pins as plugs, but IEC 60050 refers to these as 'direct plug-in equipment' defined as equipment in which the mains plug forms an integral part of the equipment enclosure so that the equipment is supported by the mains socket-outlet. In this article, the term 'plug' is used in the sense defined by IEC 60050. Sockets are designed to prevent exposure of bare energised contacts. Sockets may also have protruding exposed contacts, but these are used exclusively for earthing (grounding). 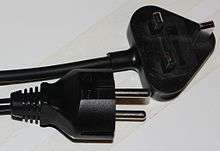 The term plug is in general and technical use in all forms of English, common alternatives being power plug, electric plug, and (in the UK) plug top. 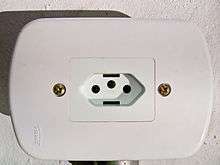 The normal technical term (in both British and International English) for an AC power socket is socket-outlet, but in non-technical contexts a number of other terms are in common use. In British English the general term is socket, but there are numerous common alternatives, including power point, plug socket, wall socket, and wall plug. 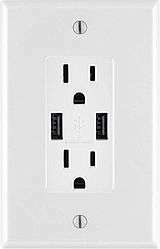 In American English receptacle and outlet are common, sometimes with qualifiers such as wall outlet, electrical outlet and electrical receptacle, all of these sometimes to be found in the same document. A socket may be surrounded by a decorative or protective cover called a wall plate, face plate, outlet cover, socket cover, or wall cover. In some designs this is an integral piece with the socket itself, bought and installed as a single unit. Electrical sockets for single phase domestic, commercial and light industrial purposes generally provide either two or three electrical connections to the supply conductors. Two-pin sockets normally provide neutral and line connections, both of which carry current and are defined as live parts. Neutral is usually very near to earth potential, usually being earthed either at the distribution board or at the substation. Line (also known as phase or hot, and commonly, but technically incorrectly, as live) carries the full supply voltage relative to the neutral (and to earth). Three-pin sockets provide, in addition, a protective earth connection for exposed metal parts of an appliance. If internal insulation should fail, a short-circuit to the earthed exposed metal parts will hold them at a low potential, and should operate fuses or circuit breakers to isolate the faulty appliance from the supply. Depending on the supply system, some sockets may have two line connections, each at significant voltage to earth and without a neutral pin; for example, a split phase system may have 240 V between line connections each at 120 V with respect to earth ground; but a single-phase receptacle connected to a three-phase system may have, for example, 208 V between contacts and only 120 V between each contact and earth ground. Illustration of "Tripin" 3-pin earthed plug dated 1911. As electricity became a common method of operating labour-saving appliances, a safe means of connection to the electric system other than using a light socket was needed. According to British Author John Mellanby the first plug and socket in England was introduced by T.T. Smith in 1883, and there were two-pin designs by 1885, one of which appears in the (British) General Electric Company Ltd. catalogue of 1889. Gustav Binswanger, a German immigrant who founded the (British) General Electric Company Ltd, obtained a patent (GB189516898) in 1895 for a plug and socket using a concentric (co-axial) contact system. Several early American electrical plug and socket arrangements were invented by Harvey Hubbell. On 26 February 1903 he filed two patent applications featuring 2-pin plugs and adaptors for using his plugs with existing designs of lamp sockets and wall receptacles. Hubbell's first plug design had two round pins which differed from those already in use in Europe in that the tips of the pins had annular detents similar to those of present-day jack plugs to positively retain a plug in its socket. In one patent, US774,250 a plug was used with a socket which screwed into a lampholder (like the early lampholder plugs). In the other patent US776,326 the same type of plug was used with various three-way adaptors that could be connected to lampholders or "a receptacle of any ordinary type". Figures 2 and 4 of this patent show an adaptor plugged into what appears to be a "Chapman" receptacle. Hubbell evidently soon found the round pin design unsatisfactory as a subsequent patent US 774,251 filed on May 27, 1904 shows lampholder adaptors similar to those of his first patent for use with plugs having coplanar flat pins. 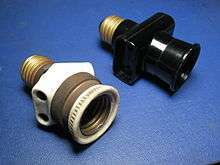 Hubbell's catalogue of 1906 includes various three-way adaptors similar to those shown in the US776,326 patent, but modified for use with the coplanar flat pin plugs. The Chapman receptacle must have been in general use at the time, as it was the only type of non-lampholder receptacle for which adaptors were supplied. The 1906 catalogue says of the Chapman adaptor: "The device avoids fastening the cords together as is necessary with the ordinary Chapman plug when used for more than one purpose." This suggests that Hubbell's original invention was prompted by his observation of the problem that arose with the use of this sort of receptacle and plug. Hubbell subsequently rotated the pins by 90 degrees to arrive at the configuration still widely used today (NEMA 1-15). Other manufacturers adopted the Hubbell pattern and by 1915 they were widespread. Gradually wall sockets were developed to supplement those that screwed into lampholders. The earthed consumer plug has several claimants to its invention. A 1911 book dealing with the electrical products of A. P. Lundberg & Sons of London describes the "Tripin" earthed plug available in 2.5 amp and 5 amp models. The pin configuration of the "Tripin" appears virtually identical to modern BS 546 plugs. In her 1914 book Electric cooking, heating, cleaning, etc. Maud Lucas Lancaster mentions an earthed iron-clad plug and socket by the English firm of Reyrolle and Co. 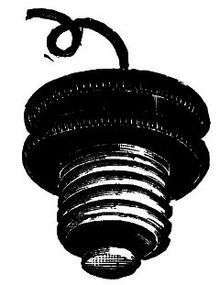 The earliest American patent application for an earthed plug appears to be 11 January 1915 by George P. Knapp, on behalf of the Harvey Hubbell company. This patent covers the use of an earthing pin which extends further than the other two contacts to ensure that it is engaged first. The configuration of the socket was not operable with existing two-contact unearthed plugs. 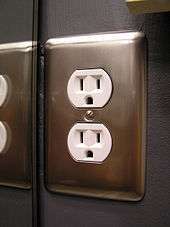 Other earthed sockets that are widely used in the US today are operable with unearthed plugs. The German Schuko-system plug is believed to date from 1925 and is attributed to Albert Büttner. The current American version of the earthed plug, with two parallel blades and a round earthing pin, was invented by Philip F. Labre, while he was attending the Milwaukee School of Engineering. It is said that his landlady had a cat which would knock over her fan when it came in the window. When she plugged the fan back in, she would get an electric shock. Labre deduced that if the fan was earthed, the electricity would go to earth through the plug rather than through the person holding it. He was issued a US patent for an earthed socket and plug in 1928. As the need for safer installations became apparent, earthed three-contact systems were made mandatory in most industrial countries. De facto standards became formalised as official national and international standards. Old installations with obsolete sockets exist. The International Electrotechnical Commission in 1934 established technical committee TC 23 for electrical fittings. Only two meetings were held before the outbreak of the Second World War. In Europe, since 1951 the International Commission on the Rules for the Approval of Electrical Equipment (CEE) has published a standard (CEE 7 Specification for Plugs and Socket-Outlets for Domestic and Similar Purposes) describing the plugs and sockets used. In 1953 the CEE published Technical Report 83 (later 60083), which was a listing of plugs and sockets then in use. 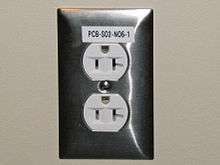 In North America the National Electrical Manufacturers' Association publishes standards for plugs and sockets. The international standard IEC 60884-1 defines the general requirements for plugs and sockets intended for household and similar purposes, IEC 60884-1 does not define specific plug and socket types which are the subject of national standards in each country. IEC 60884-1 para 9.2 does stipulate that "it shall not be possible, within a given system, to engage a plug with a socket-outlet having a higher voltage rating or a lower current rating". IEC 60884-1 para 6.1 defines the preferred voltage ratings for single phase plugs and sockets as 130 V or 250 V. The foreword of IEC 60884-1 states: "in order to promote international uniformity, IEC National Committees undertake to apply IEC Publications transparently to the maximum extent possible in their national and regional publications. Any divergence between any IEC Publication and the corresponding national or regional publication shall be clearly indicated in the latter." Consolidation of standards eases international trade and travel. For example, the CEE 7/7 plug has been adopted in several European countries and is compatible with both CEE 7/3 and CEE 7/5 sockets, while the unearthed and unpolarised CEE 7/16 Europlug is compatible with even more European and other socket types. IEC 60906-1 has been proposed as a common standard for all 230 V plugs and sockets worldwide but has been adopted only in South Africa so far, with a modified version used in Brazil. IEC 60906-2 recognizes the wide use of the NEMA 5-15 parallel blade plug and socket and recommends it for all 120 V applications. Design features of plugs and sockets have gradually developed to reduce the risk of electric shock and fire. Safety measures may include pin and slot dimensions and layout that permit only proper insertion of plug into socket, and earth pins designed such that the device becomes earthed before power is connected. Electrical insulation of the pin shanks was added to some designs, to reduce live contact exposure when a plug is partially inserted in a socket. Shutters that open only for the correct plug prevent foreign objects from contacting live slots. Some types include fuses and switches. Plugs and sockets are designed as a system to meet standards for safety and reliability. Some types of socket may accept more than one type of plug; where this is an official, approved intention of the socket design, all the approved combinations will be tested to the applicable safety standards. Occasionally, plug and socket combinations may allow power to flow but may not meet product standards for mating force, earthing, current capacity, life expectancy, or safety. Improvised or user-modified connectors will not meet the product safety standards. 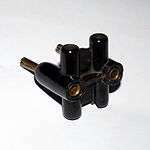 Adapters between different standards can overcome mechanical incompatibility. Physical compatibility does not ensure that the appliance and socket match in frequency or voltage. 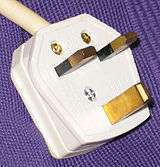 So that manufacturers need not build, distribute and maintain many similar appliances differing only in the type of plug fitted, a common strategy is to provide an IEC 60320 inlet on the appliance and a detachable power cord (mains flex lead) to allow connection of the appliance to the socket. The appliance need only to be tested to the power inlet. Some types of appliance require the consumer to also change a switch to adapt to different voltages or frequency. In addition to sockets permanently attached to building wiring, extension cords (extension leads) are used for temporary connections when a socket is not within convenient reach of an appliance's power lead. Portable equipment such as gardening power tools may have a male power inlet compatible with the connector at the end of an extension cord; this allows one long cord to be shared among several tools, and so saves storage space and cost for the consumer. Multiple small appliances may be connected to sockets on a power strip which can also include switching, surge voltage and over-current protection; a power strip equipped with different series of plug and sockets can act as an adapter for imported equipment. There are two basic standards for voltage and frequency in the world. One is the European standard of 220–240 volts at 50 Hz, and the other is the North American standard of 120 volts at a frequency of 60 Hz. The differences arose for historical reasons as discussed in the article Mains electricity. The plugs and sockets used in each country are set by national standards, some of which are listed in the IEC technical report TR 60083, Plugs and socket-outlets for domestic and similar general use standardized in member countries of IEC. The IEC also maintains a Web page giving arbitrary letter designations for generally compatible types of plugs. The IEC Web page does not identify the national standards corresponding to each plug letter. The letter codes are often used as a de facto naming standard when comparing different AC power plugs, especially when describing travel adapters. Physically identical sockets may be connected to voltages incompatible with an appliance. The letter codes do not identify all the variants of a plug and socket family for different current ratings or for special purposes, and not all plug types have been assigned letters. Where an IEC letter code exists it is shown in this article. The plug and socket used in Class 1 applications in Argentina is defined by IRAM. The applicable standards are: IRAM 2073 "Two poles plugs with earthing contact for domestic and similar purposes, rated 10 A and 20 A, 250 V a.c." and IRAM 2071 "Two pole socket - outlets with earthing contact for 10 A and 20 A, 250 V a.c, for fixed installations." It is similar in appearance to the Australasian and Chinese plugs. The pin length is same as the Chinese version. The most important difference from the Australian plug is that the Argentinian plug is wired with the line and neutral contacts reversed. 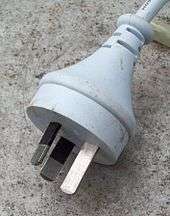 In Brazil, a very similar plug and socket are still commonly used for high-power appliances like air conditioners, dishwashers, and household ovens. Since Brazil adopted the NBR 14136 standard which includes a 20 A version, the original motivation to use the so-called Argentinian plug has ceased to exist. 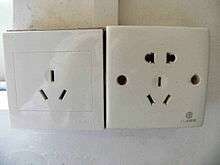 The plug used in Australia, New Zealand, Fiji, Tonga, Solomon Islands, and Papua New Guinea has an earthing pin and two flat current-carrying pins forming an upside down V-shape. The flat blades measure 6.5 by 1.6 mm (0.256 by 0.063 in) and are set at 30° to the vertical at a nominal pitch of 13.7 mm (0.539 in). Australian and New Zealand wall sockets almost always have switches on them for extra safety, as in the UK. An unearthed version of this plug with two angled power pins but no earthing pin is used with small double-insulated appliances, but the sockets always include an earth pin. Few private houses in Brazil have an earthed supply, so even if a three-pin socket is present it is not safe to assume that all three terminals are actually connected. Most large domestic appliances were sold with the option to fit a flying earth tail to be locally earthed, but many consumers were unsure how to use this and so didn't connect it. The new standard has an earth pin which in theory eliminates the need for the flying earth tail. BS 546 3-pin plugs. Left to right: 15 A, 5 A and 2 A.
Shaver supply unit for BS 4573, US, Australian and Europlugs. Because they have no earth connections they have been or are being phased out in most countries. The regulations of countries using the CEE 7/3 and CEE 7/5 socket standards vary in whether CEE 7/1 sockets are still permitted in environments where the need for earthing is less critical. Sweden, for example, prohibited them from new installations in 1994. In Romania, when the electrical installation of a premises is being replaced earthed sockets are installed; yet CEE 7/1 wall sockets are still available in hardware stores, and in rural areas of the country there are still houses being built and outfitted with sockets lacking the earth connection in rooms other than the bathroom and kitchen, following the formerly standard practice in Romania. In Germany unearthed sockets are rare, whereas in the Netherlands and Sweden it is still common to find them in "dry areas" such as in bedrooms or living rooms. 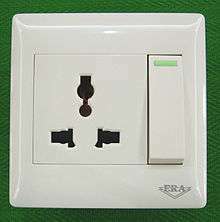 Some countries prohibit use of unearthed and earthed sockets in the same room, in the "insulated room" concept, so that people cannot touch an earthed object and one that has become live, at the same time. Two Schuko (CEE 7-3) socket-outlets manufactured by Busch-Jaeger Elektro GmbH, the lower has protective shutters, the upper does not. 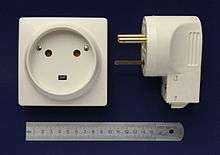 Alternative II, popularly known as the Europlug, is a flat plug. It is also defined by Cenelec standard EN 50075 "Flat non-rewirable two-pole plugs, 2.5 A 250 V, with cord, for the connection of class II-equipment for household and similar purposes" which has national equivalents in most European countries, as described in IEC 60083. The Europlug is not rewirable and must be supplied with a flexible cord. 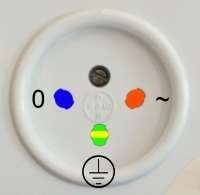 Because it is unpolarised, it can be inserted in either direction into a socket, so line and neutral are connected arbitrarily. Plugs and sockets are usually designed together, with the contacts of the socket part designed to accept the specific pin diameter, pin length, and pin spacing of the mating plug part. However, there is no socket defined by EN 50075; neither is there a socket specified in CEE 7 to accept only 4 mm (0.157 in) pins or the profile of a Europlug. (There are examples of sockets on the market which accept only such plugs, sometimes in multiples, but these meet no recognized standard.) Instead of being designed with a matching socket, the Europlug was designed to be compatible with a range of sockets in common use throughout mainland Europe. These sockets, including the CEE 7/1, CEE 7/3 (German/"Schuko"), CEE 7/5 (French), and most Israeli, Swiss, Danish and Italian sockets, were designed to accept pins of various diameters, mainly 4.8 mm but also 4.0 mm and 4.5 mm, and are usually fed by final circuits with either 10 A or 16 A overcurrent protection devices. To improve contact with socket parts intended to receive pins having a diameter larger than 4.0 mm the Europlug has two round, slightly flexible pins which converge slightly towards their free ends. Apart from use in continental Europe, the Europlug is also used in the Middle East (Iran), most African nations, South America (Argentina, Bolivia, Brazil, Chile, Peru and Uruguay), Asia (India, Bangladesh, Sri Lanka, Indonesia, Pakistan, South Korea, Malaysia and Singapore) as well as Russia and the former Soviet republics, such as Ukraine, Armenia, Georgia, and many developing nations. Where permitted it is also used, by means of adaptors, in many nations, particularly former British colonies, which use the BS 1363 standard. The Danish socket will also accept the CEE 7/16 Europlug or CEE 7/17 Schuko-French hybrid plug. CEE 7/4 (Schuko), CEE 7/7 (Schuko-French hybrid), and earthed CEE 7/6 French plugs will also fit into the socket but should not be used for appliances that need earth contact. 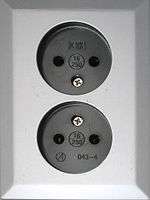 The current rating on both plugs is 13 A.
Sockets for the Schuko were not permitted until 15 November 2011. It could also result in a bad connection of the pins, with resultant risk of overheating and fire. Many international travel adapter sets sold outside Denmark match CEE 7/16 (Europlug) and CEE 7/7 (Schuko-French hybrid) plugs which can readily be used in Denmark. Pins which are 4 mm in diameter, the centres spaced 19 mm apart. The 10 A three-pin earthed rear entry plug is designated CEI 23-50 S11 (there are also two side-entry versions, SPA 11 and SPB 11). The 10 A two-pin unearthed plug is designated CEI 23-50 S10. The 10 A three-pin earthed socket is designated CEI 23-50 P11, and the 10 A two-pin unearthed socket is designated CEI 23-50 P10. Both 10 A sockets also accept Europlugs. Pins which are 5 mm in diameter, the centres spaced 26 mm apart. The 16 A three-pin earthed rear entry plug is designated CEI 23-50 S17 (there are also two side-entry versions, SPA 17 and SPB 17). The 16 A two-pin unearthed plug is designated CEI 23-50 S16. The 16 A three-pin earthed socket is designated CEI 23-50 P17, there is not a 16 A two-pin unearthed socket. The 16 A socket used to be referred to as per la forza motrice (for electromotive force, see above) or sometimes (inappropriately) industriale (industrial). The two standards were initially adopted because up to the second half of the 20th century in many regions of Italy electricity was supplied by means of two separate consumer connections — one for powering illumination and one for other purposes — and these generally operated at different voltages, typically 127 V single phase and 220 V single or split phase. The electricity on the two supplies was separately metered, was sold at different tariffs, was taxed differently and was supplied through separate and different sockets. Even though the two electric lines (and respective tariffs) were gradually unified beginning in the 1960s (the official, but purely theoretical date was the summer of 1974) many houses had dual wiring and two electricity meters for years thereafter; in some zones of Lazio the 127 V network was provided for lighting until 1999. The two gauges for plugs and sockets thus became a de facto standard which is now formalized under CEI 23-50. Some older installations have sockets that are limited to either the 10 A or the 16 A style plug, requiring the use of an adapter if the other gauge needs to be connected. Numerous cross adapters were used. Appliances with CEE 7/7 (German/French) plugs are often sold in Italy, but the standard sockets will not always accept them since the pins of the CEE 7/7 plugs are thicker (4.8 mm) than the Italian ones (4 mm). Adapters are standardized in Italy under CEI 23-57 which can be used to connect CEE 7/7 plugs to linear CEI 23-50 sockets. Bipasso socket (#1) and Italian adapted Schuko (#2) in a modern installation. The simplest type, designated CEI 23-50 P17 has a central round hole flanked by two figure-8 shaped holes, allowing the insertion of both 10 A and 16 A Italian plugs and the Europlug. The advantage of this socket style is its small, compact face. Vimar brand claims to have patented this socket first in 1975 with their Bpresa model; however soon other brands started selling similar products, mostly naming them with the generic term presa bipasso (twin-gauge socket) that is now of common use. A second, quite common type looks like a Schuko socket, but adds a central earthing hole. This design can accept CEE 7/4 (German), CEE 7/7 (German/French), and Italian 10 A plugs. Some of these sockets may also have figure-8 shaped holes to accept Italian 16 A plugs as well. Its drawback is that it is twice as large as a normal Italian socket and the price is higher; for those reasons Schuko and bipasso-Schuko socket have been rarely installed in Italy until recent times. Other types may push compatibility even further. The Vimar-brand universale (all purpose) socket, for example, accepts CEE 7/4 (German), CEE 7/7 (German/French), Italian 10 and 16 A plugs, and also NEMA 1-15 (US/Japan) plugs (older versions also had extra holes to accept UK shaver plugs). The Swiss standard is SN SEV 1011:2009 Plugs and socket-outlets for household and similar purposes. The standard defines a hierarchical system of plugs and sockets with two, three and five pins, and various ratings. Sockets will accept plugs with the same or fewer number of pins and the same or lower ratings. The three phase variants of the standard are also described at Industrial and multiphase power plugs and sockets. All of the single phase connectors, described here, are rated at 250 V.
The type 11 plug is unearthed, the centres of the two 4 mm diameter round pins are spaced 19 mm apart. The type 12 plug adds a central 4 mm diameter round earth pin, offset by 5 mm. The type 12 socket has no recess, the type 13 socket is recessed. Both sockets will accept type 11 and type 12 plugs, and also the 2.5 A Europlug. Earlier type 11 & 12 plugs had line and neutral pins without sleeved pins, when partially inserted into non-recessed sockets these present a shock hazard. Since 1 January 2013, only type 11 & 12 plugs with line and neutral pins partially sleeved are allowed to be imported and distributed to reduce the risk. From 2017 only recessed sockets will be allowed to be installed, minimizing the risk of electric shocks. The type 15 plug has 3 round pins (of the same dimensions as type 12) plus 2 flat rectangular pins. It is designed for three phase applications with a voltage rating of 250 V / 400 V.
The recessed type 15 socket with five openings (3 round and 2 flat rectangular) and with a voltage rating of 250 V / 400 V will accept plugs of types 11, 12, 15 and the Europlug. The type 25 plug has 3 rectangular pins of the same dimensions as type 23, plus 2 rectangular pins. It is designed for three phase applications with a voltage rating of 250 V / 400 V.
The recessed type 25 socket with five rectangular pins and with a voltage rating of 250 V / 400 V will accept pliugs of types 11, 12, 15, 21, 23, 25 and the Europlug. A separate standard SN SEV 1011:2009/A1:2012 (published as an appendix to SEV 1011:2009), Plugs and socket-outlets for household and similar purposes - A1: Multiway and intermediate adaptors, cord sets, cord extension sets, travel adaptors and fixed adaptors defines the requirements applicable to multiway and intermediate adaptors, cord sets, cord extension sets, and travel and fixed adaptors, it covers the electrical safety and user requirements, including the prohibition of stacking (the connection of one adaptor to another). Non-conforming products must be withdrawn from the Swiss market before the end of 2018. The plug and socket are rated 16 A 250 V a.c. and are intended for use only on systems having nominal voltages between 200 V and 250 V a.c. The plug pins are 4.5 mm in diameter, line and neutral are on centres 19 mm apart. The earth pin is offset 3.0 mm. The line pin is on the left when looking at a receptacle with the earth pin offset down. Shutters over the line and neutral pins are mandatory. Socket polarity, with wire color coding. The pre-1989 system has three flat pins in a Y-shape, with line and neutral 19 mm (0.75 in) apart. The plug is rated at 16 A. 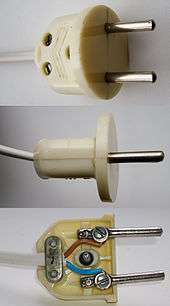 In 1989 the standard was revised, with three round 4.5 mm (0.177 in) pins in the same locations designed to allow the socket to accept both older and newer Israeli plugs, and non-earthed Europlugs (often used in Israel for equipment which does not need to be earthed and does not use more current than the Europlug is rated for). Pre-1989 sockets which accept only old-style plugs have become very rare in Israel. IEC 60906-2 uses NEMA 5-15. Harvey Hubbell patented the parallel blade plug in 1913, where the blades were equal width (US Pat.1064833) and then polarized it in 1916 (US Pat. 1180648). 5-20RA (Canada) or 5-20R (USA) T-slot socket mounted with the earth hole up. The neutral connection is the wider T-shaped slot on the right. As NEMA 5 currents increase, changes are made to the plug's neutral blade so that it will not fit into receptacles rated for a lower current. Some receptacles rated for higher currents are designed to accept multiple shapes for the neutral blade, so that both higher and lower draw devices are compatible with it. The NEMA 5-20 AP variant has a "horizontal" neutral blade (in a plane that would intersect the hot blade). The receptacle has a T-slot for the neutral blade which accepts either 15 A parallel-blade plugs or 20 A plugs. A 30 A, 4-wire single-phase earthing socket is often used for electric clothes dryers. 240 volts from the split phase system is used for the heating elements, and the motor and controls run on 120 volts. These plugs have blades that are rather larger than NEMA 5-20, are more widely spaced, and are angled so as to prevent using the wrong plug in the wrong circuit. These plugs have L-shaped neutral blades that will not fit in a NEMA 14-50 receptacle. This is a 50 A, 4-wire earthing socket usually installed in kitchens and used for electric cooking ranges and ovens supplied with 240 V by the split phase system. Similar to dryers on 14-30 sockets, these usually have lights, fans, timers, etc., that are run from 120 V (obtained from one of the 120 legs to neutral). Many plug-in electric cars also use this type of socket for recharging in the owner's garage (but in this case neutral is not needed). It is also commonly found in RV parks to provide electricity to recreational vehicles. These plugs have a straight neutral blade that will not fit in a NEMA 14-30 receptacle. Older Japanese sockets and multi-plug adapters are unpolarized—the slots in the sockets are the same size—and will accept only unpolarized plugs. Japanese plugs generally fit into most North American sockets without modification, but polarized North American plugs may require adapters or replacement non-polarized plugs to connect to older Japanese sockets. In Japan the voltage is 100 V, and the frequency is either 50 Hz (East Japan) or 60 Hz (West Japan) depending on whether the customer is located on the Osaka or Tokyo grid. Therefore, some North American devices which can be physically plugged into Japanese sockets may not function properly. Japan also uses an earthed plug similar to the North American NEMA 5-15. However, it is less common than its NEMA 1-15 equivalent. 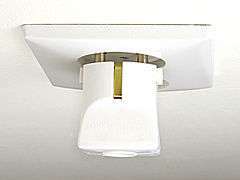 Since 2005, new Japanese homes are required to have class I earthed sockets for connecting domestic appliances. This rule does not apply for sockets not intended to be used for domestic appliances, but it is strongly advised to have class I sockets throughout the home. Thai Industrial Standard (TIS) 166-2547 and its subsequent update TIS 166-2549 stipulated a modification of the IEC 60906-1 plug, replacing prior standards which were based on NEMA 1-15 and 5-15, as Thailand uses 220 V electricity. The plug has two round power pins 4.8 mm in diameter and 19 mm in length, insulated for 10 mm and spaced 19 mm apart, with an earthing pin of the same diameter and 21.4 mm in length, located 11.89 mm from the line connecting the two power pins. It was designed to provide compatibility with prior hybrid three-pin sockets, which accept NEMA 1-15, NEMA 5-15 and Europlugs, all of which have been variably used in Thailand. The hybrid socket is also defined in TIS 166-2547, in addition to a plain three-round-pin socket, with plans to replace the former and phase out support for NEMA-compatible plugs. Sockets are polarised (as in NEMA 5-15). The plug is similar to, but not interchangeable with, the Israeli SI32 plug. The Thai plug has not been designated with a letter code at IEC World Plugs. 1 2 Type letters are from the International Electrotechnical Commission (IEC) Web site that provides classification letters similar to a United States Department of Commerce publication that sees widespread but not universal use to differentiate plug and socket types based on rough mechanical compatibility. Most common household plugs have an associated letter. 1 2 3 4 5 6 7 8 9 10 11 12 Will accept unearthed plugs. ↑ There are some CEE 7/17 plugs with special shape which are polarised when used with CEE 7/5 sockets (mechanically only). ↑ CEE 7/1 socket accepts earthed CEE 7/3, CEE 7/5 and CEE 7/7 plugs but provides no earth connection. ↑ BS 4573 and BS EN 61558-2-5 do not explicitly specify a current rating for a compliant plug, see BS 4573 section of British and compatible standards. 1 2 CEE 7/7 specifies an earthed hybrid plug that will fit into both the CEE 7/3 and CEE 7/5 sockets. CEE 7/17 specifies an unearthed hybrid plug that will fit into both the CEE 7/3 and CEE 7/5 sockets. ↑ Plug can only be inserted one way with French CEE 7/5, but lack of wiring convention means that the system is not polarized. 1 2 The recess provided by CEE 7/3 and CEE 7/5 sockets offers protection against touching the live pins of CEE 7/4, CEE 7/6 and CEE 7/7 plugs. When used in CEE 7/1 (unearthed) sockets, or "universal adaptors" there is no protection for those plugs. ↑ The actual rating of non-rewirable plugs is marked according to the fuse fitted by the cord set manufacturer, the fuse rating being determined by the rating of the flexible cable. ↑ Polarized on earthed versions only. 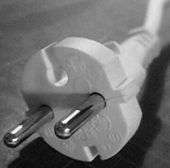 ↑ Import of plugs with non-partially-insulated pins no longer allowed after 2012. 1 2 Type L comes in two variations with ratings of 10 A & 16 A having different pin diameters and spacing from each other. A second type of multi socket that accepts British plugs in addition to Euro, NEMA American and Australian plugs. Although the Low Voltage Directive of the European Union specifically excludes domestic plugs and sockets and CE marking is neither applicable nor permitted on plugs and sockets, it is still sometimes fraudulently used on universal sockets. Leviton NEMA 5-15R duplex receptacle with integrated USB sockets. Adaptors allow travellers to use portable devices with foreign sockets. Adaptors allow physical connection between plug and socket but do not change voltage or frequency. A voltage converter is required for electrical compatibility in countries with a different voltage than the device is designed for, if it is not designed for variable voltage input. 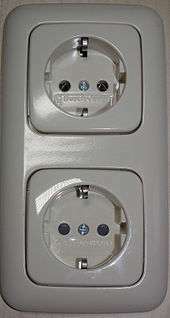 Multisocket adapters allow the connection of two or more plugs to a simple socket. They are manufactured in various configurations, depending on the country and the region in which they are used, with various ratings. In Europe for example, they are called double or triple adapters, and transform a one socket into a multiple socket. This has the advantage of connecting more than one electrical consumer item to one single socket and is mainly used for low power devices (TV sets, table lamps, computers, etc.). They are usually rated at 6 A 250 V, 10 A 250 V, or 16 A 250 V, however this is the general rating of the adapter (for example, if we have an adapter for four sockets and it is marked 16 A 250 V, this means that the adapter should not be loaded more than 16 A, whether one, two, three or all sockets are used. Some people overload them, thus leading to accidents). In some countries these adapters are banned and are not available in shops, as they may lead to fires due to overloading them. In the past, these adapters were made from ceramic, Bakelite or other fire resistant plastics, but nowadays they are made from various available plastics that can be safely used in electrical devices (such as PA6, PVC, PP). Some low quality adapters are made from plastics not approved for electrical use (such as PS or non fire resistant ABS), and these may cause fires in the case of overheating due to overloading or bad contacts. Right: adapter for CEE 7/17 and CEE 7/4 plugs. An early American electrical plug and socket was invented by Harvey Hubbell and patented in 1904. Hubbell's first design was a socket which screwed into a lampholder (like the early lampholder plugs), but with a separable plug with pins (U.S. Patent 774,250)or blade (US patent 774251). The 1906 Hubbell catalog shows the blade plug with a flush mounting socket for use in wall or floor. Other manufacturers adopted the Hubbell pattern, and by 1915 they were widespread. Another obsolete socket, made by Bryant, 125 V 15 A and 250 V 10 A rating. A NEMA 5‐20 125 V 20 A or 6‐15 250 V 15 A plug with a missing earth pin would fit this socket, but a NEMA 2‐20 plug is slightly too big to fit. The upper slots as seen in the illustration connect to silver-colored wiring screws on the upper side, and the lower slots connect to brass-coloured wiring screws on the lower side. The parallel and tandem socket accepts normal parallel NEMA 1‐15 plugs and also tandem NEMA 2‐15 plugs. Both pair of socket are fed internally by the same supply. A more recent and fairly common version of this type is the T-slot socket, in which the locations of the tandem and the parallel slots were combined to create T-shaped slots. This version also accepts normal parallel NEMA 1‐15 plugs and also tandem NEMA 2‐15 plugs. Incidentally, a NEMA 5‐20 (125 V, 20 A), a NEMA 6-15 (250 V, 15 A) or 6‐20 (250 V, 20 A) plug with a missing earth pin would fit this socket. Contrary to popular belief, this receptacle was never intended to accept 240 volt plugs nor is it an ungrounded version of a 20 amp duplex receptacle. The reason for the design was that in the early 1900s there were two competing plug designs in use in North America - the common and more familiar parallel blade 1-15p as well as a two-prong tandem (or flat blade design). 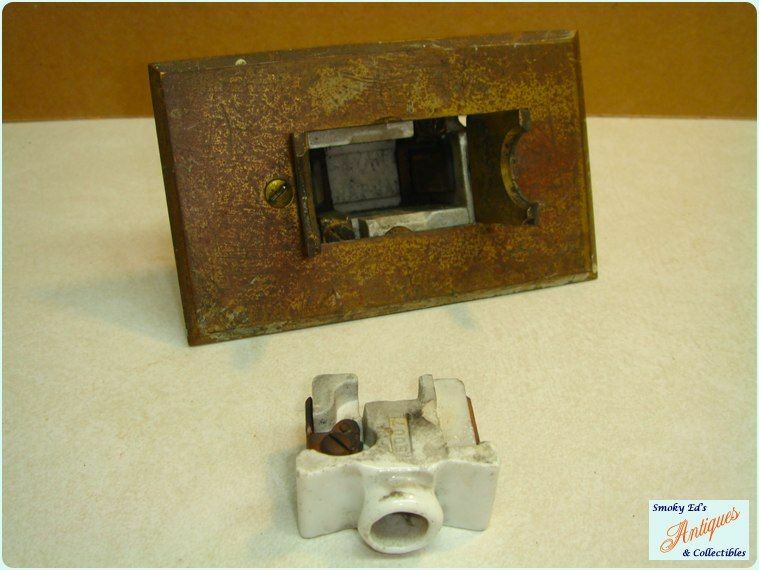 This receptacle type has been unavailable in retail shops since the 1960s but still available from the manufacturer Leviton (model 5000-I) for replacement only and not for new installations. Harvey Hubbell had patented the parallel blade plug in 1913, and patented a polarized version in 1916. He also patented the T-slot single outlet in 1915, and a duplex T-slot outlet in 1916 both meant to take his older 1904 tandem and newer parallel plug design. (Single, US Pat. 1146938, Duplex US Pat. 1210176). Screws into a light bulb socket to add two jacks, while still taking the bulb. Made in the USA by Eagle Electric. Some appliances sold in the Soviet Union had a flat unearthed plug with an additional pass-through socket on the top, allowing stacked arrangement of plugs. This design was very helpful (for the usual Soviet apartment of the 1960s had very few sockets), but somewhat unsafe, as the brass cylinders of the secondary socket were uncovered at the ends (to unscrew them easily), recessed by only 3 mm and provided bad contact because they relied on the secondary plug's bisected expanding pins. The pins of the secondary plug (without insulation sleeves) could not be inserted into the cylinders completely, and were accessible through a 5 mm gap between the primary and secondary plugs. Mainly used for low power appliances (for example connecting to a socket a table lamp and a radio). 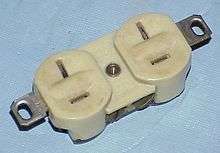 This style of connector, produced by Italian manufacturer BTicino, appeared in the 1960s and was intended as an alternative to the Europlug or CEI 23-16 connectors then in use. The socket is an almost rectangular socket, with one or more lateral key pins and indentations to prevent inverting the polarised plug, or connecting plugs and sockets with different current ratings. At least four models were produced: three single-phase general purpose connectors rated respectively 10 A, 16 A and 20 A; plus a three-phase industrial connector rated 10 A; all of them have different key-pin positioning so plugs and sockets cannot be mismatched. The socket is closed by a safety lid (bearing the word ‘’Magic’’ on it) which can be opened only with an even pressure on its surface, thus preventing the insertion of objects (except the plug itself) inside the socket. The contacts are blades positioned on both sides of the plug; the plug is energized only when it is inserted fully into the socket. The obvious drawback of the system is that it is not compatible with Europlugs. As household appliances were never sold fitted with these security plugs and the use of adapters would defeat all of the newly introduced safety features, once this system is adopted all standard plugs must be cut off and replaced with the appropriate security connector. However, the Magic security system had some success at first because its enhanced safety features appealed to customers; standard connectors of the day were considered not safe enough. The decline of the system occurred when safety lids similar to the Magic type were developed (VIMAR Sicury) and then applied to standard sockets by third brands and by BTicino itself. IEC 60320 appliance couplers, the connections at the other end of power cords. ↑ Scott, C.; Wolfe, P.; Hayes, B. (2004). Snort For Dummies. Wiley. p. 227. ISBN 9780764576898. Retrieved 7 February 2016. ↑ Fullick, P. (2001). Physics for AQA. : Coordinated award. Pearson Education. ISBN 9780435584207. Retrieved 7 February 2016. ↑ Linsley, T. (2008). Advanced Electrical Installation Work. Taylor & Francis. ISBN 9781136444487. Retrieved 7 February 2016. ↑ "IEC/TR 60083 Ed. 6.0, IEC, 2009". techstreet.com. Retrieved 7 February 2016. ↑ Douglas, J. (2010). Building Surveys and Reports. Wiley. p. 254. ISBN 9781444391084. Retrieved 7 February 2016. ↑ Odom, W. (2004). Computer Networking First-step. Cisco Press. p. 38. ISBN 9781587201011. Retrieved 7 February 2016. ↑ Stein, B. (1997). Building Technology: Mechanical and Electrical Systems. Wiley. p. 723. ISBN 9780471593195. Retrieved 7 February 2016. ↑ "IEC 60050 - International Electrotechnical Vocabulary - Details for IEV number 195-02-06: "neutral conductor"". electropedia.org. Retrieved 7 February 2016. ↑ "IEC 60050 - International Electrotechnical Vocabulary - Details for IEV number 195-02-08: "line conductor"". electropedia.org. Retrieved 7 February 2016. ↑ Williams, N.; Sargent, J.S. (2012). Electrical Inspection Manual, 2011 Edition. Jones & Bartlett Learning, LLC. p. 29. ISBN 9781449695538. Retrieved 7 February 2016. ↑ Scaddan, B. (2011). 17th Edition IEE Wiring Regulations: Explained and Illustrated. Newnes. p. 44. ISBN 9780080969176. Retrieved 7 February 2016. ↑ Tzimenakis, J.; Holland, D. (2000). Electrical Product Safety: A Step-by-step Guide to LVD Self-assessment. Newnes. p. 58. ISBN 9780750646048. Retrieved 7 February 2016. ↑ "The History of Electric Wiring" (1957), London: Macdonald. ↑ "Photograph of Chapman receptacle and plug". Smokey Ed's Antiques and Collectables. 2013. Retrieved 19 September 2015. 1 2 Harvey Hubbell, Inc (August 1906). Electrical specialities : catalogue and price list No. 9. pp. 56–57. Retrieved 19 September 2015. 1 2 "History". Hubbell. 2009. Retrieved 20 March 2010. ↑ Witte (1922). "The Automobile Storage Battery Its Care and Repair". Powerstream. Archived from the original on 24 August 2007. Retrieved 14 September 2007. 1 2 Crist (2005). "Sockets" (tutorial). Mosaic shades. Retrieved 14 September 2007. ↑ "SMALL SWITCHES, etc., and their CIRCUITS" (1911), MAYCOCK, W. Perren, London: S. Rentall & Co.
↑ Lancaster, M.L. ; Lancaster, E.W. ; Coles, S.L. (1914). Electric Cooking, Heating and Cleaning: A Manual of Electricity in the Service of the Home. D. Van Nostrand Company. p. 312. Retrieved 7 February 2016. ↑ "IEC - World Plugs: Brief history". International Electrotechnical Commission. Retrieved 1 September 2014. ↑ "IEC Webstore preview Retrieved 19 October 2011" (PDF). Retrieved 12 March 2013. 1 2 3 4 World Plugs Retrieved on 2015-03-27. 1 2 "Electric Current Abroad" (PDF). US Department of Commerce, International Trade Administration (retrieved 9 October 2015). 2002. ↑ ftp://ftp.cencenelec.eu/CENELEC/TCs/61/PlugsSockets.pdf Plugs and socket types in each CENELEC country, Retrieved 15 February 2012. ↑ "Mains Plugs with Insulated Pins. Australian Standards AS/NZS3112:2000 & AS/NZS3112:2004 refer [sic]". Access Communications. 19 April 2007. ↑ "Norma ABNT NBR 14136:2002" (in Portuguese). BR: Projeto de redes. ↑ "Archived copy". Archived from the original on 5 March 2016. Retrieved 2015-12-01. 9) Aquele fiozinho que tem pendurado atrás da minha geladeira, vai desaparecer? ↑ "IEC - World Plugs". International Electrotechnical Commission. Retrieved 27 August 2014. ↑ BS 1363 (1995), BS 1363:1995 "13 A plugs, socket-outlets, adaptors and connection units , British Standards Institute. 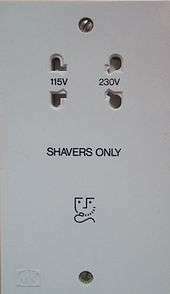 ↑ BS 4573 (1970), British Standard Specification for two-pin reversible plugs and shaver socket-outlets, British Standards Institution. ↑ "IECEE CEE-7 ed2.0". Retrieved 1 March 2015. ↑ "IEC/TR 60083: Technical Report" (PDF). Retrieved 2 March 2015. 1 2 "Guidlines on the application of Directive 2006/95/EC". p. 7. Retrieved 24 February 2015. ↑ "Det nye afsnit 6C i stærkstrømsbekendtgørelsen træder i kraft pr. 15. november 2011". Danish Safety Technology Authority (in Danish). Retrieved 19 September 2015. ↑ "International electrical standards and regulations" (PDF). Legrand. pp. 14, 22, 30. Retrieved 16 November 2015. ↑ "The Plugs and Sockets etc. (Safety) Regulations 1994". The Plugs and Sockets etc. (Safety) Regulations 1994. Opsi.gov.uk. 1994. Retrieved 16 November 2015. ↑ De Cesco G.: Acqua Luce Gas. Manuali pratici del far da sé. I Jolly bricolage. Fratelli Fabbri Editori, Milano, 1975. PP 70–71. ↑ De Cesco G.: Acqua Luce Gas. Manuali pratici del far da sé. I Jolly bricolage. Fratelli Fabbri Editori, Milano, 1975. PP 56–57. ↑ De Cesco G.: Acqua Luce Gas. Manuali pratici del far da sé. I Jolly bricolage. Fratelli Fabbri Editori, Milano, 1975. P 93. ↑ "Bestreben Nach Sicherheit | Vimar". Vimar.de. Retrieved 12 March 2013. ↑ "SEV 1011:2009, Plugs and socket-outlets for household and similar purposes" (PDF). Electrosuisse, SEV Verband für Elektro-, Energie- und Informationstechnik. 2009. Retrieved 27 August 2014. ↑ "Information SEV 1011 – power socket/plug/connector" (PDF). Federal Inspectorate for Heavy Current Installations ESTI, Swiss Confederation. 1 August 2011. Retrieved 22 August 2014. 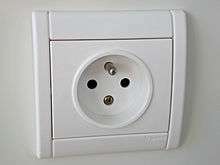 1 2 "New standard for plugs in Switzerland starting from 2013" (PDF). Federal Inspectorate for Heavy Current Installations ESTI, Swiss Confederation. 13 May 2011. Retrieved 22 August 2014. ↑ "Plug Type J" (web page). International Electrotechnichal Commission. Retrieved 22 August 2014. Type C plugs are perfectly compatible with Type J sockets. ↑ "SEV 1011:2009/A1:2012, Plugs and socket-outlets for houshold [sic] and similar purposes - A1: Multiway and intermediate adaptors, cord sets, cord extension sets, travel adaptors and fixed adaptors" (PDF). Electrosuisse, SEV Verband für Elektro-, Energie- und Informationstechnik. 2012. Retrieved 27 August 2014. ↑ Dario Marti, Director (March 2013). "Plugs and socket-outlets for household use and related purposes: New product requirements for the Swiss market" (PDF). Federal Inspectorate for Heavy Current Installations ESTI, Swiss Confederation. Retrieved 27 August 2014. ↑ "International standardization of electrical plugs and socket-outlets for domestic use". CH: IEC. ↑ "When Less is More...". ZA: Crab tree. ↑ "SANS 164 standards: a working group perspective" (PDF). ZA: EE publishers. ↑ "SI 32 part 1.1, draft, 3/2013. Figure #203" (PDF). The Standards Institution of Israel (in Hebrew). p. 14. Retrieved 19 September 2015. ↑ "National Electrical Installation Standards Yearbook" (PDF). National Electrical Contractors Association. ↑ "Electricity in Japan". japan-guide.com. 2015. Retrieved 19 September 2015. ↑ Alice Gordenker (19 July 2011). "Japan's incompatible power grids". The Japan Times. Retrieved 3 September 2015. ↑ "内線規程　改訂のポイントの解説ページ". Archived from the original on 24 January 2012. ↑ Thai Industrial Standard 166-2547: Plugs and socket-outlets for household and similar purposes: plugs and socket-outlets with rated voltage not exceeding 250 V (PDF) (in Thai). TH: Thai Industrial Standards Institute. ISBN 974-9815-94-7. Retrieved 23 November 2011. ↑ "Investigation looking at the safety implications of the installation of universal socket-outlets in the UK for domestic and commercial use" (PDF). Electrical Safety Council UK. 12 November 2012. Retrieved 19 September 2015. ↑ "Universal Sockets". universalsocket.org.uk. Retrieved 19 September 2015. ↑ "Fraudulant use of CE Marking". Retrieved 24 February 2015. ↑ "US patent 1,179,728". United States Patent and Trademark Office. Retrieved 19 September 2015. ↑ Terrell Croft, Wiring for Light and Power, McGraw-Hill, 1924, pp. 198–99. ↑ "Tripoliki". Museum of Plugs and Sockets. Retrieved 19 September 2015. ↑ "Miniature Circuit Breakers" (PDF). UK: MK Electric. p. 4. Retrieved 22 April 2010. ↑ "Non-standard BS 1363 types". Museum of Plugs and Sockets. Retrieved 19 September 2015. 1 2 De Cesco G.: Acqua Luce Gas. Manuali pratici del far da sé. I Jolly bricolage. Fratelli Fabbri Editori, Milano, 1975. P 73. ↑ De Cesco G.: Acqua Luce Gas. Manuali pratici del far da sé. I Jolly bricolage. Fratelli Fabbri Editori, Milano, 1975. P 75. ↑ La ricerca della sicurezza. Il brevetto Sicury www.vimar.eu. Retrieved 12 February 2009. ↑ Catalogo online. Installazione civile Archived 28 February 2009 at the Wayback Machine. www.professionisti.bticino.it. Retrieved 12 February 2009.